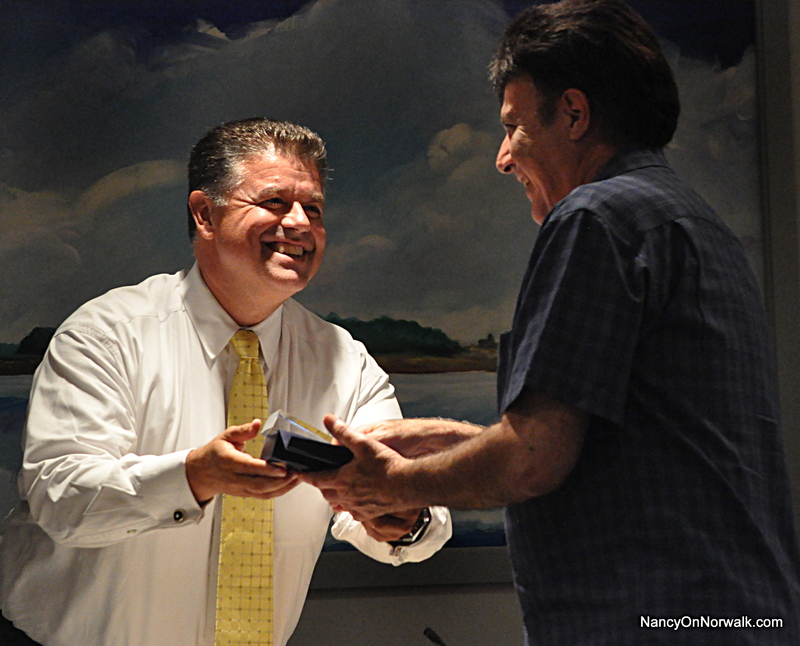 Norwalk Board of Education member Artie Kassimis hands Assistant Superintendent Tony Daddona a token of the board’s esteem Tuesday evening. Daddona was being recognized for his efforts as interim superintendent. NORWALK, Conn. – A surprisingly large amount of money in the Norwalk Board of Education’s piggy bank is expected to be used to keep classroom sizes low this school year and pay down the notorious deficit covered by the city last year. The proposal on how to spend a $1.6 million 2013-2014 surplus will be sent to the Board of Estimate and Taxation after a unanimous BOE vote Tuesday. • Eight high school house masters and four middle school assistant principals will return to year round work. The positions were made into 11 month positions during last year’s budget cuts, but are now returning to 12 month positions. The board did not say what the total cost of that would be. Now, where did the money come from? Lyons said the board knew the surplus was building up at the end of the fiscal year in June, but final numbers came in just last week. That fluctuating figure was $500,000 at one point, but ended at $2.5 million, he said. Interim Chief Operating Officer Rich Rudl said it’s actually $1.6 million, after you take out $900,000 of expenses from the last school year. “There were a number of items that would have posted to 2012-2013 if it wasn’t for timing issues, contractual obligations, elections of severances to be deferred for January payment,” he said. Board member Steve Colarossi continued his windmill tilting, protesting the city’s ability to take whatever it wants from the board’s surplus. On June 25, during the board’s reconciliation, Colarossi expressed disappointment that the board could not use any of the $1.2 million that was left in the insurance fund reserve, a result of fewer claims than had been budgeted for. The money was used instead as a repayment of last year’s deficit. To recap: The BOE had been facing $5.8 million in cuts to then-Superintendent Susan Marks’ proposed operating budget when a $4 million deficit in the insurance accounts was uncovered by then Chief Operating Officer Elio Longo, bringing the needed cuts to nearly $10 million. The $4 million was eliminated, in part, when the BET allowed the BOE to repay $3.1 million over three years. The $1.2 million grab in June now appears to be followed by a $500,000 grab in August, leaving just $100,000 “owed” to the city. After a futile attempt to debate Rudl on the topic, Colarossi confirmed with Lyons that the board was asking the BET for permission to use its own money. “(It’s) like change when we send our children shopping, only the city has more power to take it back than I do with my daughters,” he said. Lyons reminded him that, under state law, the city determines how much money the board gets. The board can then spend it any way it wants to. Lyons trumpeted the windfall as the result of “real good job” on the part of Rudl, former interim Superintendent Tony Daddona and Longo. “They were very proactive with freezes on purchase orders starting last March, very careful with management of some of the building stuff, management of staffing,” he said. “Every month they would come in and give us the budget report. The substitute teachers (expense) was running above budget but that run up meant that we didn’t have to hire full-time positions this year, and that net saved us a lot of money. He said he hopes to have a surplus next year as well. Seems like they were over funded last year then. And just what do house masters do for 12 months a year when school is only in session 10 months? What do reserve teachers do? Help the teachers aides? You couldn’t afford and teacher’s aides’ aides for this money? This is disgusting. There are a number of factual errors in the background given for the insurance reserve account. But the fact remains for a host of reasons (not the least of which were errors made inputting the amounts the BOE voted to fund in 2011 into the actual budget document that controlled spending), there was a shortfall in the account for paying retiree insurance claims of about two million dollars. There were other deficits in other accounts due to overspending by the former administration, but those were unrelated to the insurance issue. The background to the insurance deficit issue, and how it was handled (or mishandled), and the absence of any formal agreement between the Common Council, BET and BOE, all give rise to financial surprises to the BOE and the need for someone on our Board to actively question how spending decisions are being made regarding the “loan” and why accounting-jargon is used to justify that real dollars are being taken (as they were in June of 2013) when there are real students with real educational needs for whom the dollars could be better spent. (4) that the references to “a deficit on an accrual basis” in the insurance reserve account is nothing more than a reference to the 2011-2012 problem, and is not an indication that sufficient funds aren’t in that account to pay current insurance claims as they come due. The questions asked by 2+2 are good ones– “reserve teachers” are teaching positions that are funded because enrollment projections indicate that the BOE will need to hire more teachers (so the money is put on reserve until the new staff is hired, then it is transferred to the salary account). The issue with the housemasters arose because their hours and pay were cut without negotiation in 2012, and the BOE lost the grievance that they had filed (of course, if there had been any good-faith bargaining, the positions would have been changed, and money would have been saved).